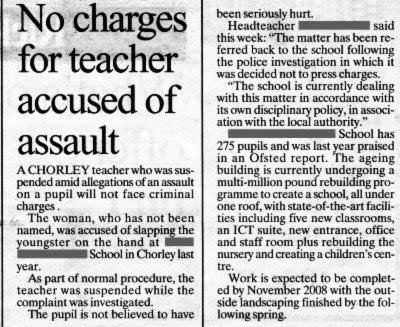 Once again I find myself in the newspapers - Chorley Guardian, 02 April 2008. The malicious cruelty of everything that has befallen me is unbearable and once again I feel so miserable. The same article also had been published by the Lancashire Evening Post on 27 March 2008 - it seems likely that the story had been released to the press on the day of my hearing - probably as a precautionary measure, approved by the LEA. I had spoken with the LEA last September about press statements. It seemed morally wrong that they should contribute to an article without alerting the individual of its impending publication. They agreed that it was an oversight and that they would review their policies. In future, I was assured that every effort would be made to contact the person to prevent unnecessary distress. You get used to hearing empty meaningless words that have no sincerity - who cares ! I have pondered over these months as to who was responsible for contacting the local press. I had thought it to be my head teacher but the content was too thin and I am still puzzled. This time it must have been the head teacher - he is a bully and it is in his nature to exhibit such acts of cruelty.